With a life long passion for books and growing passion for New Zealand authors, programme hosts Ruth Todd and Morrin Rout utilise their wealth of radio broadcasting experience to bring you Bookenz. A weekly programme that brings you the latest on new books and their authors, from both New Zealand and abroad. Bookenz organises several fundraising events each year with touring writers which have proven to be very popular events to the wider community. 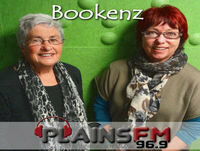 If you have a passion for reading and wish to support our local New Zealand authors, tune in to Bookenz on 96.9 Plains FM weekly at 12pm on Tuesdays, repeated 12:30pm on Saturdays.